Have data to contribute? Visit the Switchbacks Data Submission page! In short, Northwest Trails is a mapset of trails designed for upload to any map-enabled Garmin GPS receiver. It is more than just a mapset, though; it is also a community effort initiated to record and collect GPS data for trails in the Northwest (Washington, Idaho, Oregon, Montana, Wyoming, Alaska, British Columbia and Alberta) and provide that data for general public use. My GPS usage started out in 1995 as a means to map mountain bike trails in my area. Over time I collected a large quantity of track data recording various paths and routes. Tracks are very helpful when it comes to navigating a route, but the biggest problem with having a multitude of them is that no GPS can accommodate more than a few at a time. Thus, you need to know beforehand what route you want to take and, if you are talking about even a modestly sized network of trails, you have to decide which trails to cull in order for things to fit into your receiver. That's when I started thinking about custom maps for my receiver. 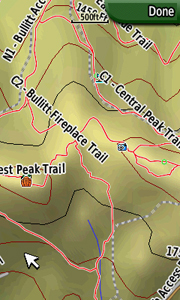 With custom maps like Northwest Trails, there is no longer a need to limit the number of trails loaded on the GPS (the maps use only a portion of map memory rather than a limited number of dedicated slots like tracks do). I set out making these maps for my own use and before long realized that a lot of other people could probably use them, too. That's why I started this project. 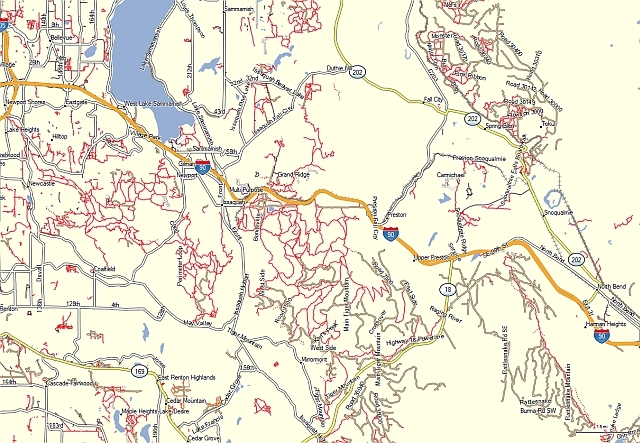 Northwest Trails is made to be "transparent", which means that when loaded with other Mapsource products (or the GPSr base map) the trails appear as data laid over the top of the other maps. Northwest Trails can also be loaded directly to the GPSr on its own. Custom type definitions are used to help distinguish trail types and make them easier to see on the map than the default trail lines. There are currently two different sets of these custom types available for those installing the product using the PC version of the installer: "Normal" presents a relatively subtle appearance and works well with most of the newer high-resolution GPS screens, while the "High Visibility" type is intended for those who want a bolder, more obvious look to the trails. This set works best for fast-moving activities during which you can't watch the screen all of the time (like mountain biking) or for lower resolution screens like those on the 60 series receivers. 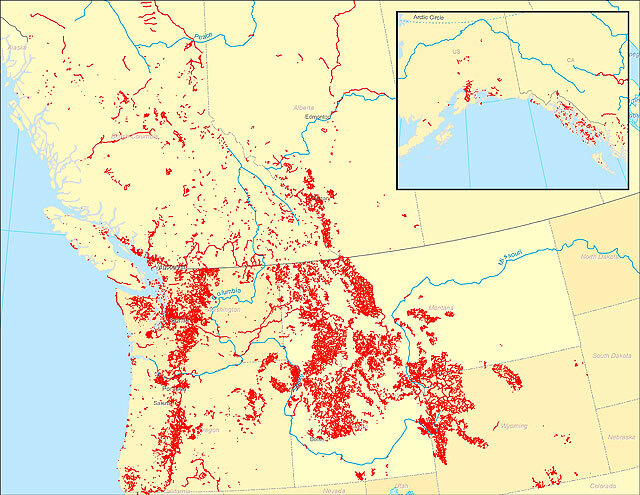 The mapset currently covers the states of Washington, Idaho, Oregon, Montana, Wyoming, Alaska, British Columbia and Alberta (see coverage map below). However, since government GIS sources of unknown quality and completeness are the source of much of this data, there is a significant need for not only additional data but also verification of virtually all of these trails by GPS-wielding users. The intent is, over time, for the coverage of the mapset to expand to include thorough GPS-verified coverage of all trails located in the Pacific Northwest. Below are a couple of example screenshots of the maps on a Garmin Colorado 400t (using the "Normal" custom line style set). 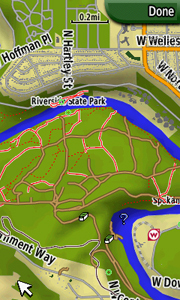 The first image shows the Riverside State Park area in Spokane with Northwest Trails layered on top of City Navigator 2009. The second shot shows a section of Squak Mountain near Issaquah, WA on top of Topo 2008. The installation of Northwest Trails is straightforward. It can be utilized from within Garmin's MapSource software (on PCs), Garmin's RoadTrip software (for Macs) or uploaded directly to your GPS unit (using freely available utilities). For use from within Garmin's MapSource (on PCs), download the .zip file from the link at the top of this page, unzip it, and then execute the mapset installer. This program will install the map files and register the mapset with MapSource. Within MapSource a new mapset product entitled "Northwest Trails" will be available in the Product drop down selection list (or from the View | Switch to Product menu option). For use with Garmin's RoadTrip (on Macs), download the .tgz file from the link at the top of this page, unarchive it into the resulting .tar file, then unpack that to a .gmapi file. This file can then be installed into RoadTrip with MapManager and onto the GPS receiver with MapInstall. The Northwest Trails mapset should overlay any other mapset present on your GPS unit. It is important to note that when you upload maps to your receiver, the existing mapset on the unit will be deleted. (Newer firmware versions on the Colorado and Oregon receivers allow for multiple map files to coexist on the units, but unless you remember to rename an already-uploaded map file, the new upload will be given the same default name as the existing one and overwrite it.) This means that if you want Northwest Trails to overlay City Navigator maps, for example, you will need to upload the chosen City Navigator maps along with Northwest Trails all at once. To switch between mapsets (if more than one has been loaded to your GPS) simply toggle the hide/show settings for the desired mapsets on your receiver. All feedback (comments, corrections, questions, etc.) is welcome and encouraged. Please direct all feedback to the email address shown at the top of this page. I try my best to reply to every email I receive but it is not always possible. I do read every email and appreciate the feedback. If you like this mapset please let others know about it. More people using and supporting this effort means more additions and corrections are possible. The core of all of these mapsets is data. The real heart of that data is tracks recorded out in the field with GPS. Since data of this accuracy is hard to come by from government and other agencies, and I cannot possibly get out there and hike all of the trails of the Northwest (although I'd like to try! ), that's where you come in! Any track data you can supply is needed and most appreciated, and will be integrated into the Northwest Trails mapset for everyone to use. Data submission is available at the Switchbacks Data Submission page. Before you start recording track data, access the Setup menu for your GPS receiver and adjust the recording frequency and quality set of your track recording to the best available. On my unit I generally set the recording method to "Auto" and the recording interval to "Most Often". Turn on the GPS receiver and allow it to have a clear view of the sky for at least 15 minutes before you begin recording. This allows the unit to connect with as many satellites as possible, which increases accuracy and helps it to maintain satellite lock. Hold or place the receiver in a location where it can best receive satellite signals as you travel. Be aware of where the antenna is located and the best orientation of the GPSr for signal strength. Patch antennas like those on the eTrex models work best when oriented horizontally, while quad helix antennas like those on the 60 series receivers tend to work best when pointed straight up. Avoid saving the track to the unit's internal memory before downloading. That reduces the number of points in the data and subsequently reduces the precision of the track. Send me the track log with the name of the trail(s) recorded and information on the type of trail (e.g. paved trail, dirt trail, unpaved road, etc.). GPX is the preferred format, but I can convert most formats. Also send along any waypoints along the route like trailheads, attractions, or summits. This mapset is free to download and use but if you find these maps useful please consider making a donation to help offset the costs incurred in producing and offering them (software licenses, website hosting, etc.). Used to merge and cull datasets and edit fields. Used for the majority of data manipulation and for digitization of paper maps. The primary tool for compiling the data into a Garmin map file. The visual interface that handles import of the data and export into a form that can be compiled by cGPSMapper.